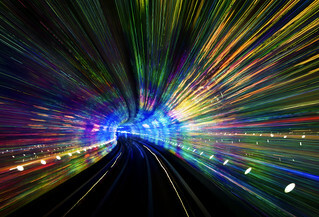 Shanghai has this incredible tunnel that goes under the river to the Bund. It's just wild inside! They have a series of robotic trains that shuttle people back and forth. Robotic doors whir open then shut again. The front of the capsule has a bubble-window that allows for a stunning view as you dip below the river and back up again. Colored lights in every lighting configuration fly by in beautiful colors. This is an amazing experience that I recommend if you ever get to Shanghai! Read the rest here at the Stuck in Customs blog.